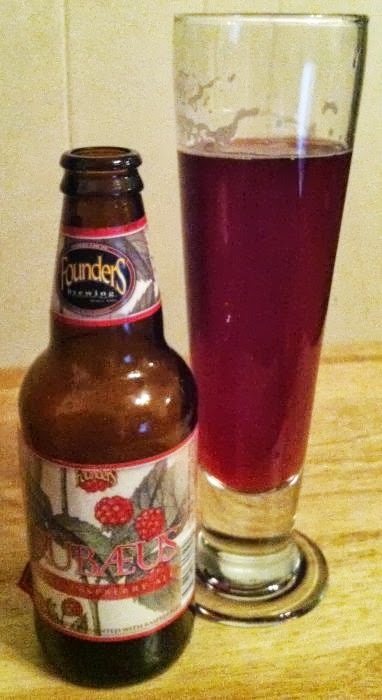 I can no longer say that I don't like fruit beer, because I like this one quite a bit. Founders Rübæus Raspberry Ale pours ruby red with a head that fades to nothing after a minute and a couple of sips. The aroma is a rich malt and bright, tart raspberries. The flavor is that, too; like raspberry jelly and a little butter on toasted dark bread. I thought I picked up on cranberries in there, but they aren't mentioned on the bottle. I wouldn't want this often, and one is enough, but I enjoyed every drop of this.